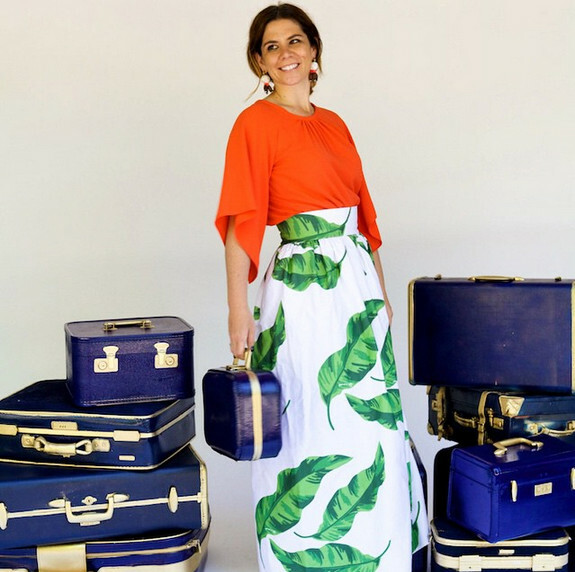 Recently, I discovered interiors and fashion designer Katie Kime via Instagram, and I fell in love with her bold “preppy goes globe trotting” style. 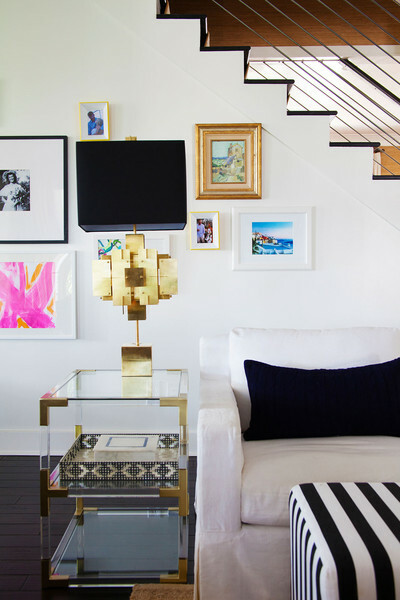 So when Lonny magazine featured her incredible Austin, Texas home this week, I was thrilled to get a peek inside! Katie is inspired by an eclectic mix of international color and flair including bright Moroccan poufs, Otomi embroidery, and Turkish kilims. She also happens to share an obsession for banana leaf, blue and white ginger jars, and the color pink. We are kindred spirits indeed! 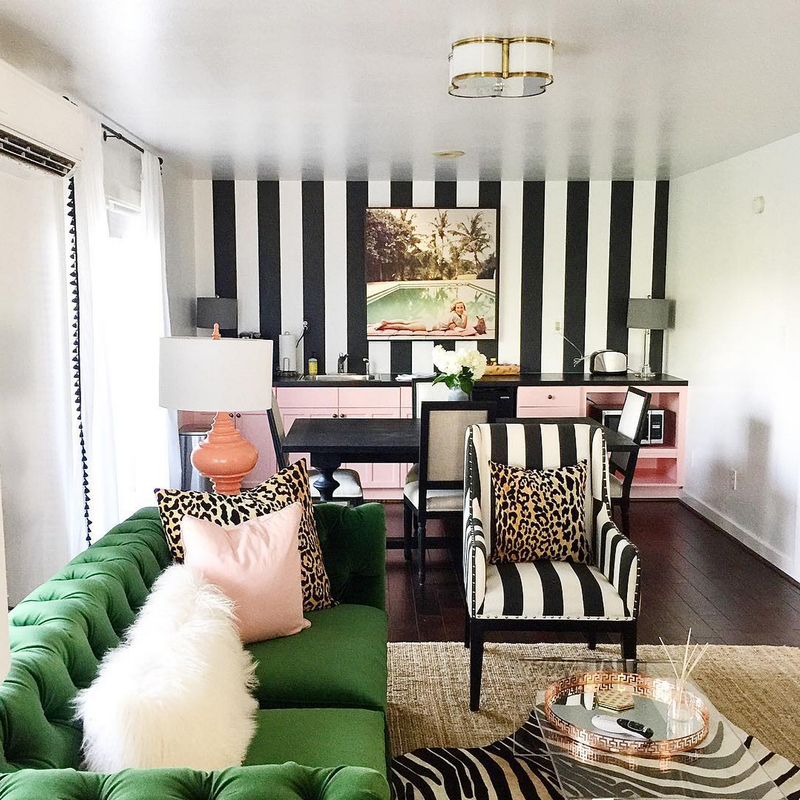 Pink and green is always a good idea, especially when mixed with black and white stripes, pom pom trim, leopard print, zebra, and Slim Aarons! 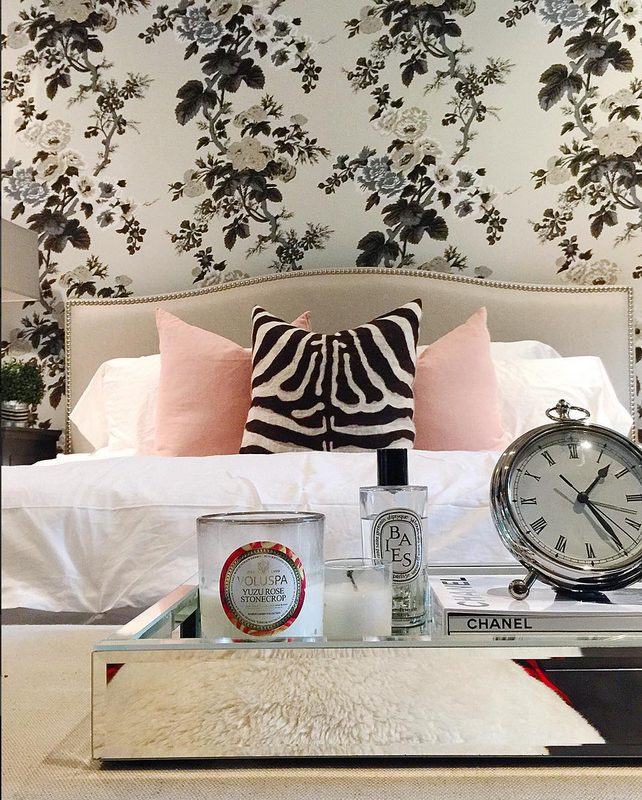 Schumacher’s Pyne Hollyhock Chintz in Charcoal has always been a favorite of mine, and I adore it here as paired with pink and zebra. A beautiful foyer vignette, and the fabulous wallpaper in the powder room is “Mums the Word” from the Katie Kime collection. 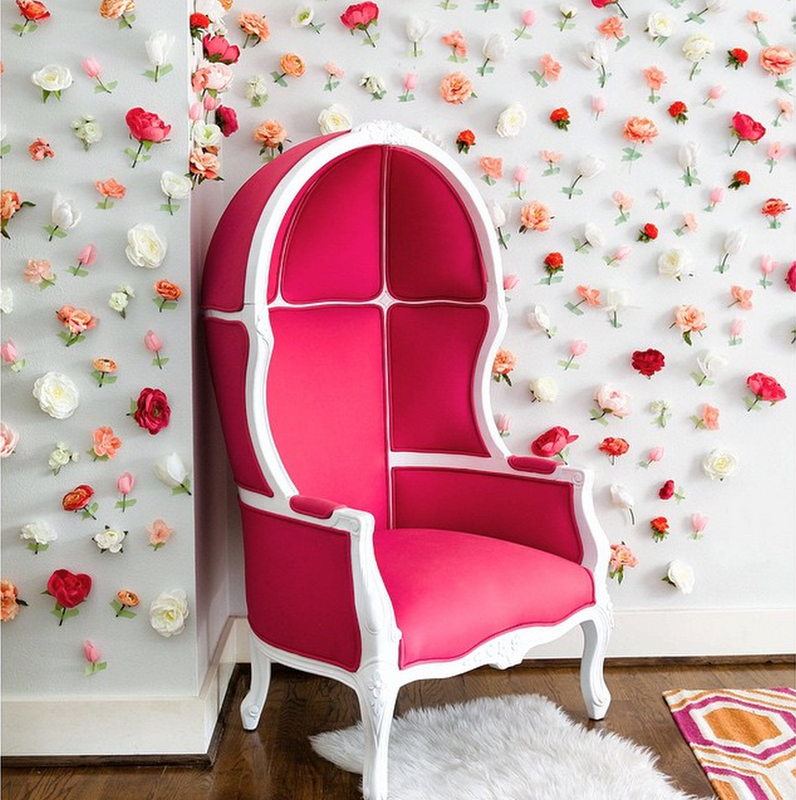 A wall adorned with faux-silk flowers creates a vibrant backdrop for Kime’s pink Birdcage chair. 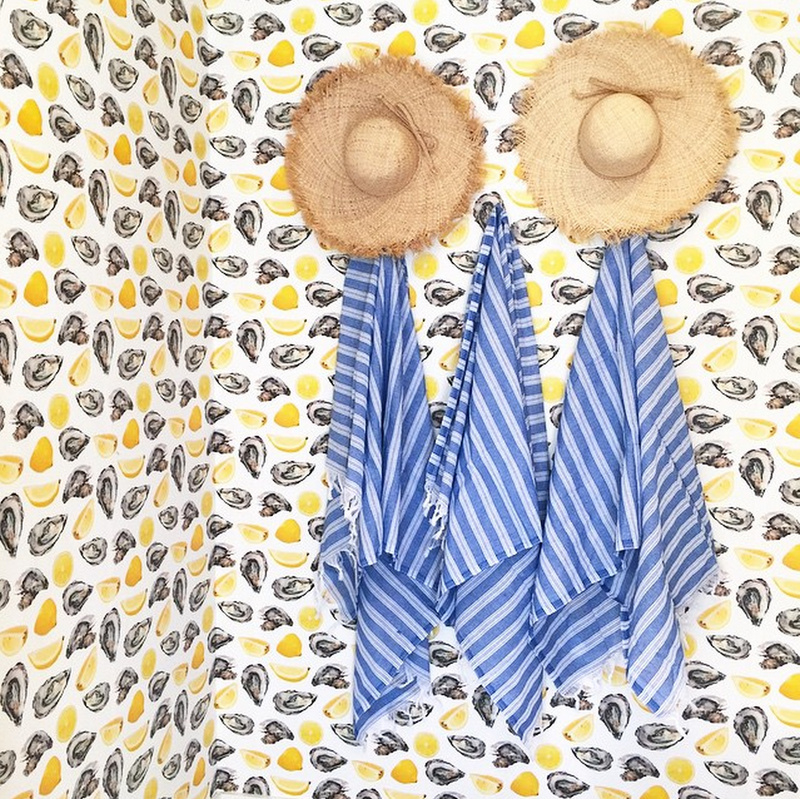 Katie Kime’s Oyster wallpaper is absolutely adorable in a pool house! 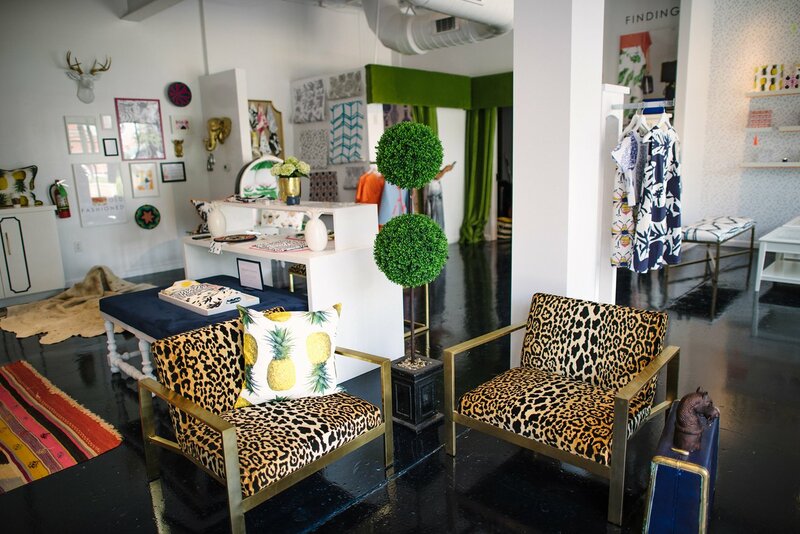 This lovely vignette is from the Katie Kilme storefront located in Austin. The combination of rich green velvet with duck blue, ginger jars, and leopard is perfection. 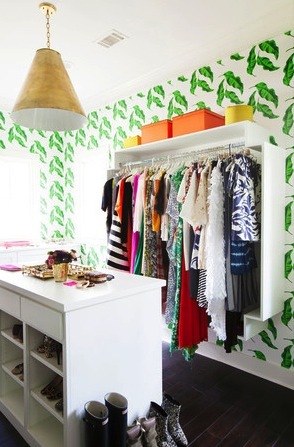 Now let’s look inside Katie’s home, as featured in Lonny magazine… Let’s start with her closet, because I still have not stopped dreaming about it! Carpenters built shelving and an island in a previously empty space to create Kime’s closet. 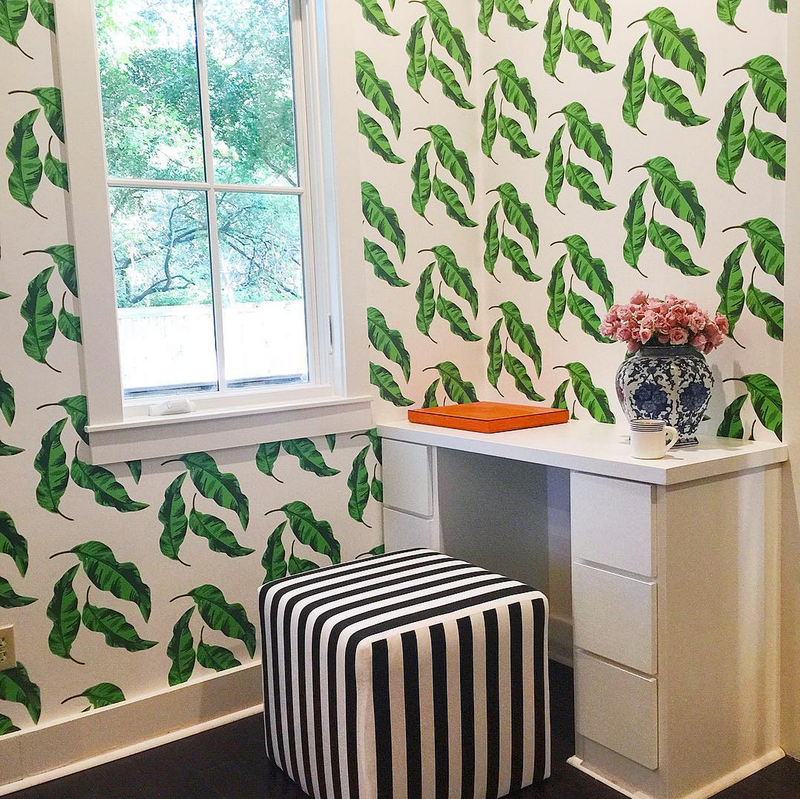 The wallpaper is from her own collection. The spacious kitchen is a natural place to host a brunch or dinner. 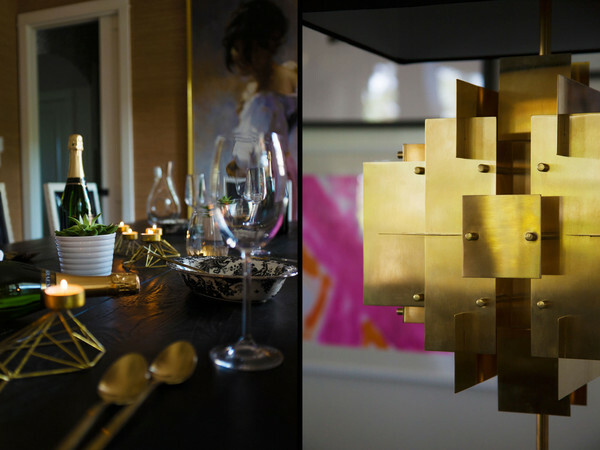 Gold-ball pendants from Dot & Bo hang over the kitchen island. The runner is from One Kings Lane. A Lucite bar cart from the Katie Kime collection makes an ultra chic kitchen island! Kime’s Seeing Spots wallpaper covers the breakfast nook. The pattern also appears on the seats of the bamboo chairs. Sliding doors, which were made by woodworker Kenneth Atkisson, separate the living room from the master suite. Kime designed the diamond pattern on the doors to match the black-and-white ottomans from One Kings Lane. 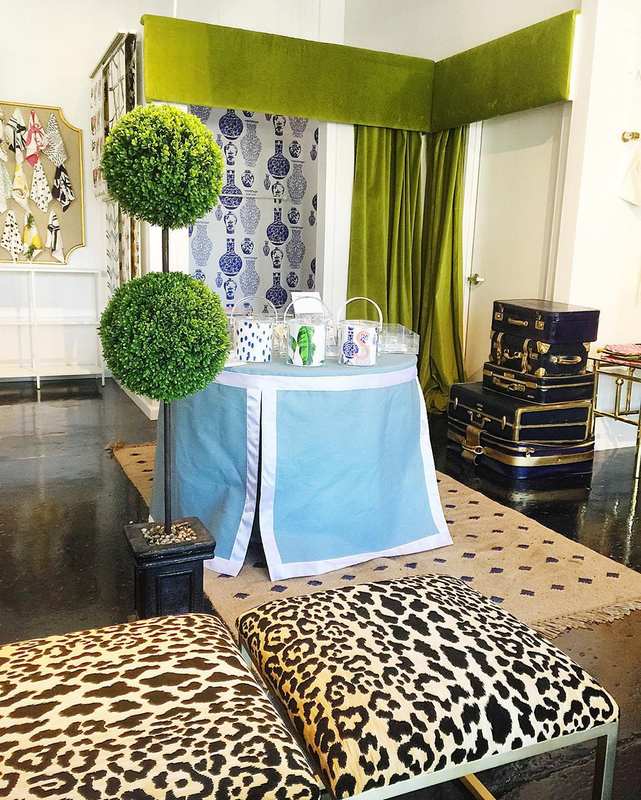 Jonathan Adler Puzzle lamps and Jacques side tables stand beside custom sofas. Setting the table. In the living room, Jonathan Adler’s Puzzle table lamp adds a luxe note. 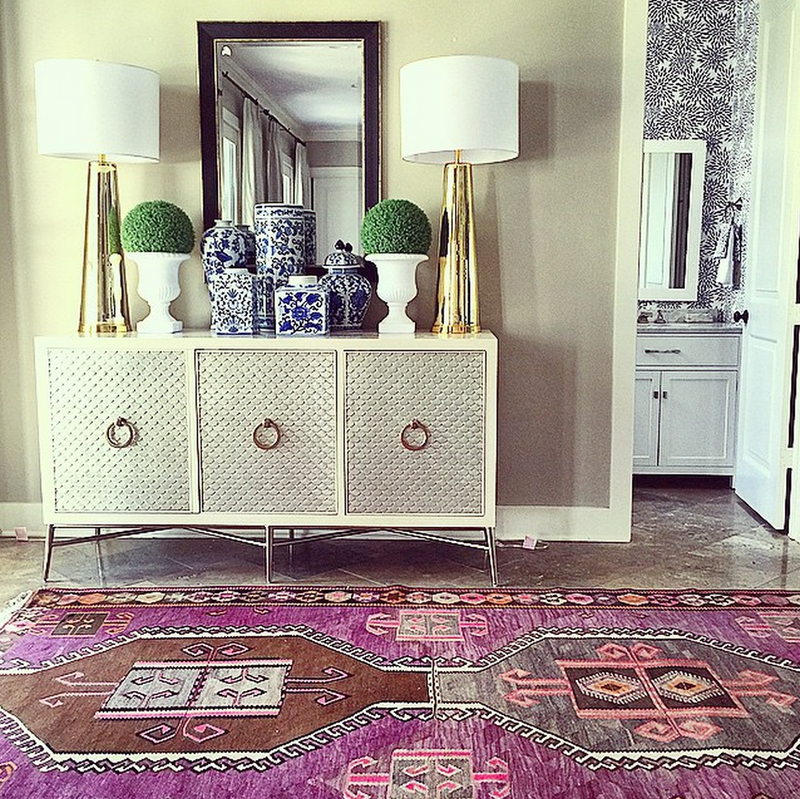 An over-dyed pink rug from One Kings Lane anchors the dining room. Behind the table is a hand-painted reproduction of John Singer Sargent’s “Rosina,” which Kime ordered from 1st Art Gallery. 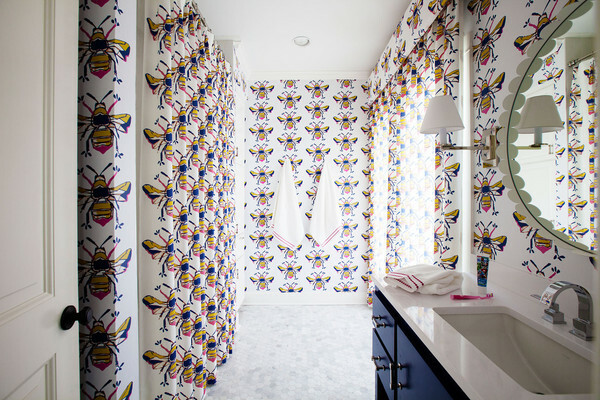 Kime’s Queen Bee pattern fills her daughter, Ava’s, bathroom. 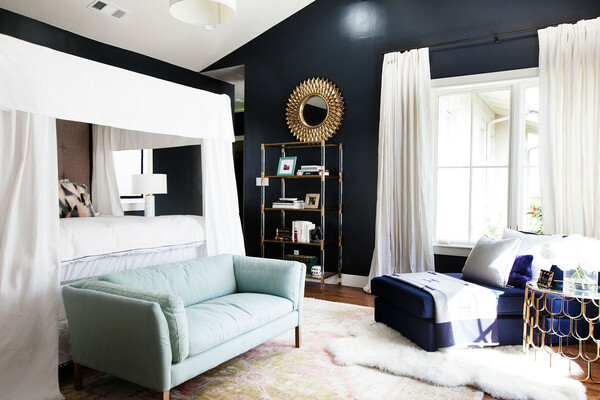 The master bedroom feels like a cozy retreat thanks to a canopy bed and Benjamin Moore’s Gravel Grey paint. 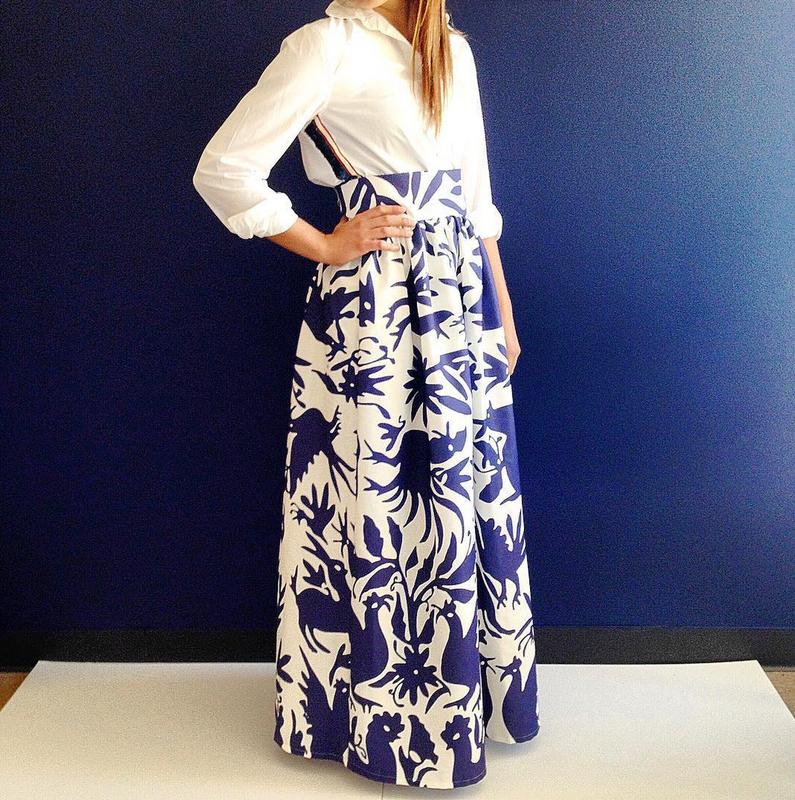 Looking great in the Ginger Jar Skirt! 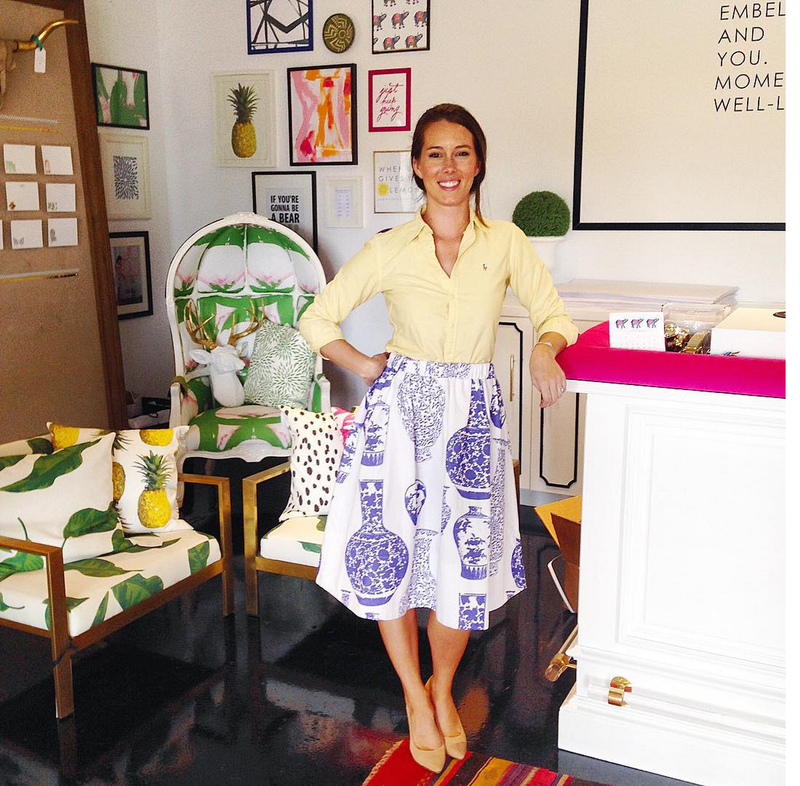 If you are ever in the Austin area, make sure to stop by Katie Kime! 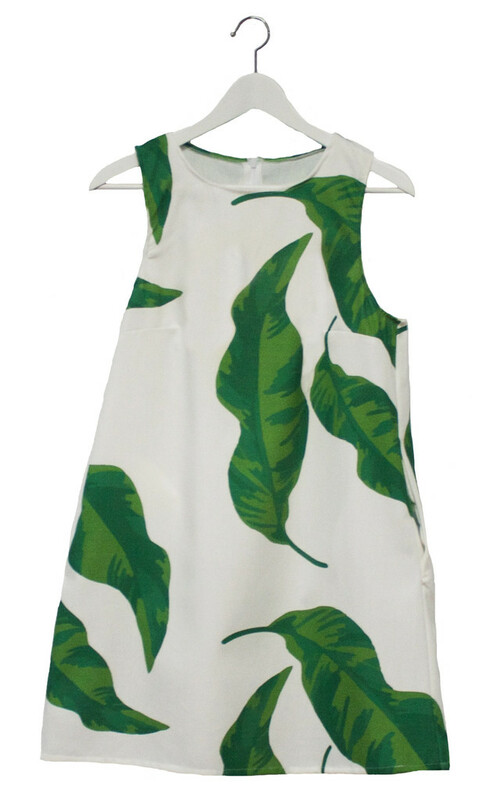 If not, you can shop her fabulous fashions and home furnishings online. I will take one of everything, please! Love this house! That kitchen is amazing. Thanks for sharing!